2015 BMA Medical Book Awards 1st Prize Award Winner in Cardiology Category! 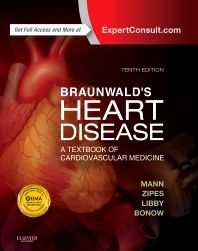 Ideal for cardiologists who need to keep abreast of rapidly changing scientific foundations, clinical research results, and evidence-based medicine, Braunwald’s Heart Disease is your indispensable source for definitive, state-of-the-art answers on every aspect of contemporary cardiology. It helps you apply the most recent knowledge in personalized medicine, imaging techniques, pharmacology, interventional cardiology, electrophysiology, and much more! In keeping with the rapid pace of advances in the field of cardiovascular medicine, the Expert Consult eBook is updated frequently with the results of late-breaking clinical trials, reviews of important new research publications, and updates on clinical practice authored by leaders in the field. These online supplements are selected and edited masterfully by Dr. Eugene Braunwald.